2012.04.01 またまた新聞に載りました!! 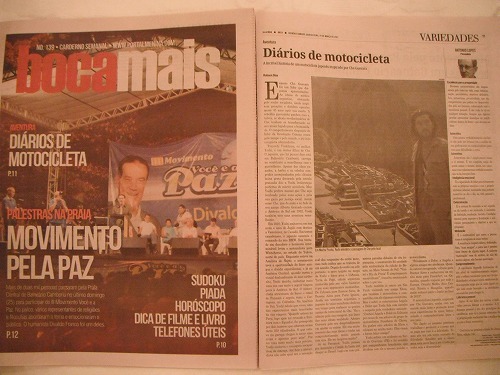 / Another article on a news paper "Diarinho"
2012.03.31 新聞記者とインタビュー! そして骨折後初乗り! / An interview woth a journalist and the first ride after the crush. 2012.03.29 新聞に載りました! / I am on the news paper!! It's 1st of April 2012 - "April fool". I did not expect to stay in South America thos long, but here I am still and having a good time! At 11am, I rode to "Chaplin's", where we met yesterday. He came to pick me up there and we rode to his place. 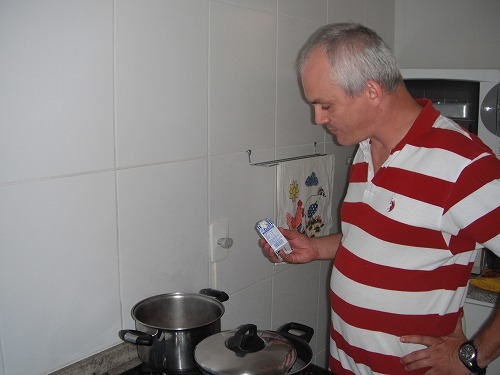 His wife Sandra is 9 month pregnant, so Mauricio cooked lunch for me. He served me some parma hams and fresh trout marinated in soy sauce and ginger as starters. They were excellent!! 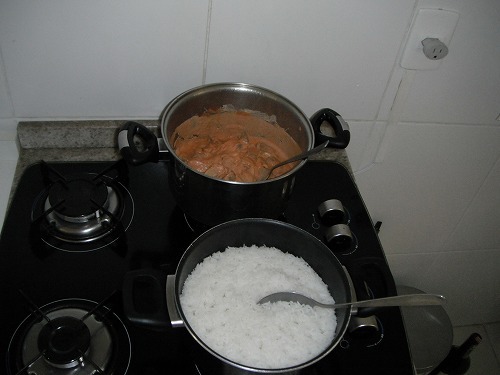 Then he made Beef Stroganov and rice as the main. He is an excellent cook!! After lunch, he suggested me to go for a short ride together. Is it OK to leave the 9-month-pregnant wife alone?? 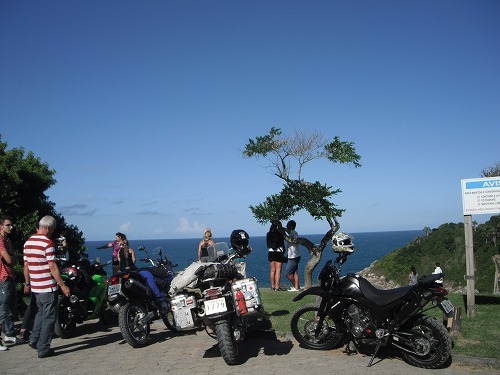 We rode through a road along side of a beautiful coast. There were some section unpaved. As I still have some pains on my rogt elbow, I took it easy to ride, but definitely it was a good rehibilitaion. 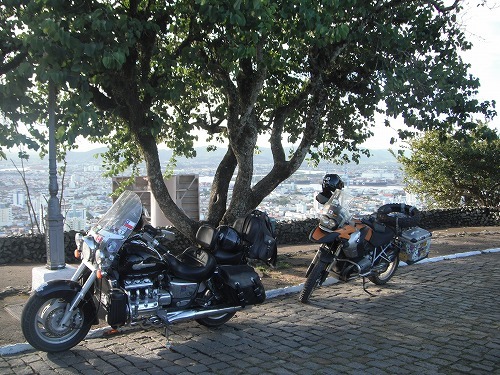 We stopped at the view point. The road reminded me of the road from Sydney to Woolongong. We went back to Mauricio's place before sunset. We had some snacks. Then we talked about motorcycles and airplanes. He likes airplanes too. I told him that Subaru - the car manufacturer - used to be Nakajima Airplanes, he was so surprised. He said "I like Subaru a lot, but from now I will like Subaru even more!!" Door called Mauricio and we went to "Chaplin's" to see Dolor&Angela. We talked at the beach side for a while. Many pepole passing by were checking out Esperanza. SOme people knew me through the TV show and news papers!! I am kinda famous guy here now. 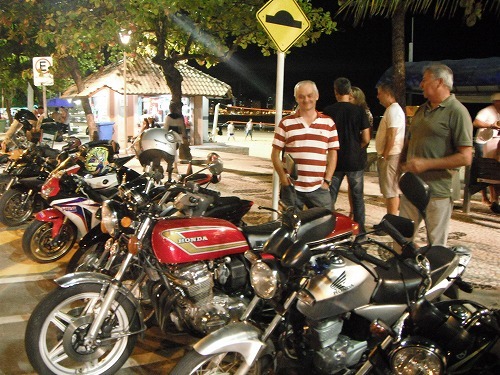 Especially Israel - a Chilean living in Sao Paulo and travellingon his Honda 300 around South Amerca - used to be married with a Japanese, we talked a lot in Spanish! It is so much easier to Speak in Spanish than Portugese. It was alread past 8pm. 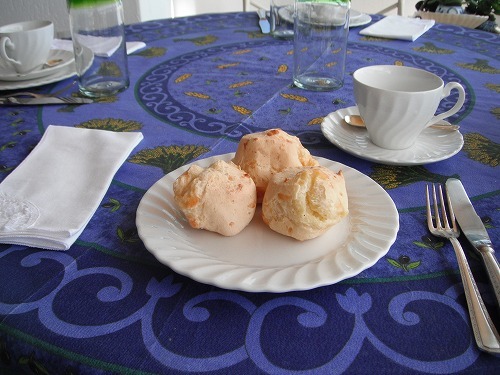 As Dolor&Angela are planing to leave to Sao Paulo tomorrow early in the mornng, so we had some snack at a cafe and went home. They have been looking after me for more than 2 weeks! 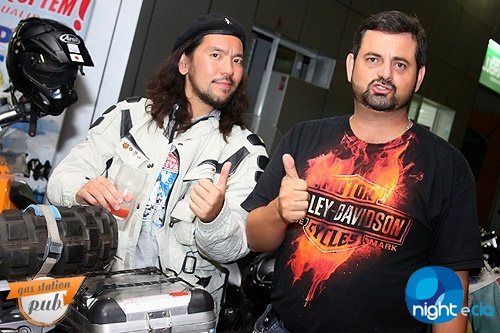 As my elbow is better, I am planning to visit my friend Daniel in Curitiba this week. 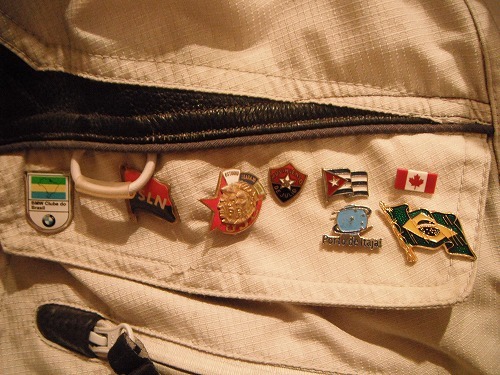 Dolor gave me a pin of Brazil flag and a pin of Port Itajai for a memory. I have to say good-ye to Dolor&Angela. Thank you sooooo much, my friends!! Have a nice trip! Bom viaem!!! またまた新聞に載りました!! / Another article on a news paper "Diarinho"
Knocks on the door woke me up. "Do you wanna go to the party @ Garage Maccori?" said Dolor. It was 7:15am. I went to bed after 3am last night (I was writing a diary), so I was really sleepy. But why should I miss the part? So we left the apartment at 7:30am. According to Dolor, today 31st of March is the anniversary of the military coup in 1964, led by General Castero Blanco who was supported by the USA. So the party started with a ceremoney of the national flag riding. 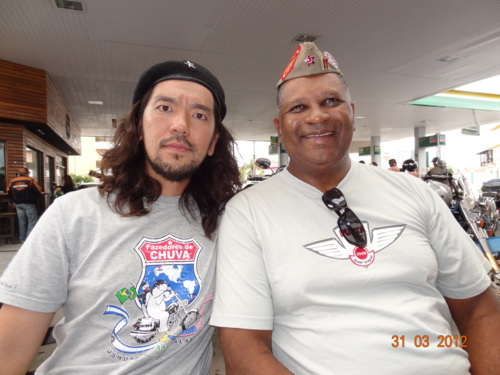 A retired navy commander RIchie - he is a Harley rider - raised the flag. Everyone saluted the floag. 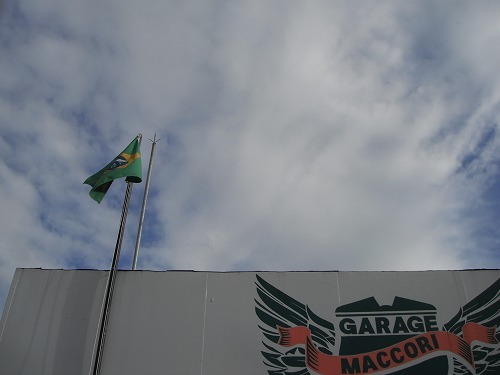 The flag was risen with honor. We had a morning coffee after the ceremoney. 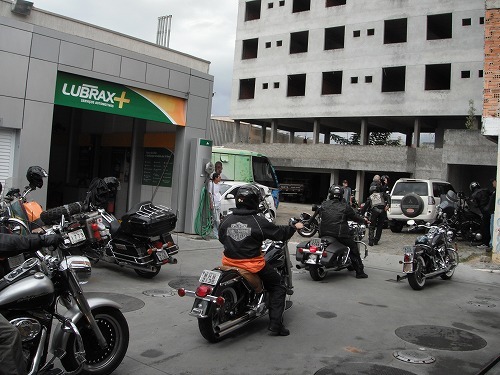 Then gradually more and more Harley Davidsons came in. I suppose there were around 50 Harleys. There were some bimmers too. BBQ was sereved to everyone. Nice. 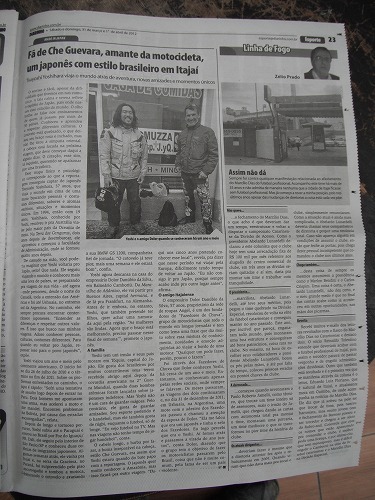 Another article about me was on the news paper "Diarinho" today. It'sin Portugese again, so I will translate it and post it on the blog tomorrow (hopefully). Dolor and I left there around 1pm. We rode to his farm house. We took a back road today - unpaved road. My arm seemed to be much better. There were some pain still, but I should be ready to continue my trip soon. After having lunch at the farm house, as I did not have enough sleep last night, I fell in asleep on a couch. 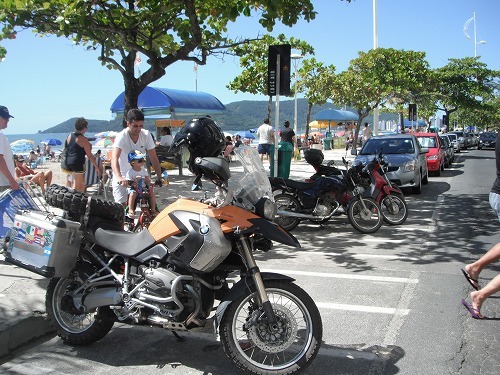 Then in the afternoon, we rode back to the apartment at Balneario Camboriu. 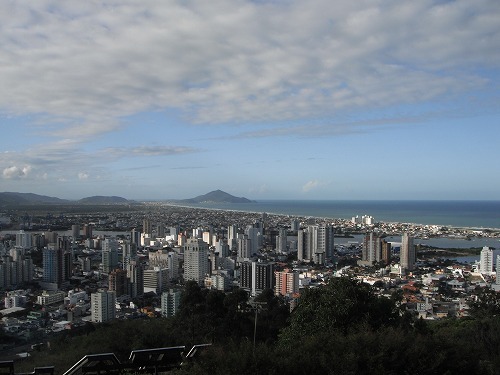 He took me to a hill where we could see the entire city of Itajai. A nice view. 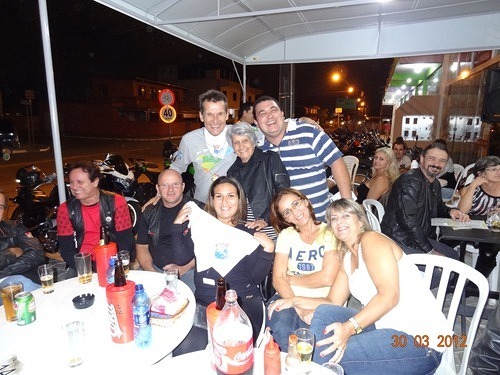 Back to Balneario Camboriu, at the beachside, I met Dolor's friends and talked about motorcycles for a while. It was a fun but long and tiring day! 新聞記者とインタビュー! そして骨折後初乗り! / An interview woth a journalist and the first ride after the crush. It'S a fine day again! I went for a work after breakfast as usual. But as Dolor will pick me up around 11:30am, I did ot go far. I walked for 1 hour and came home. 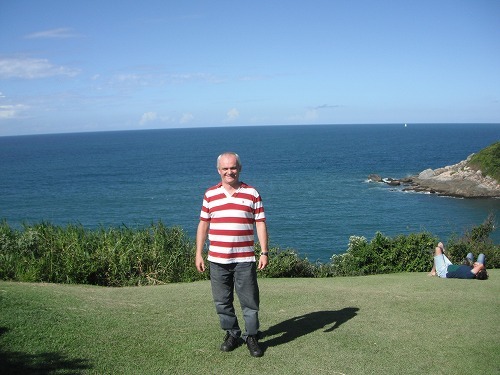 Dolor picked me up and went o the house in Itajai tohave lunch with his family. Then we went to his office to wait for a journalist and a camera man. Today Pedro would do the translation! While waiting, I chat with Pedro. whih sport I like, why I admire Ernesto "Che" Guevara, and the message to Brazilians. Pedro at the age of 13, translated the questions from the journalist immediately to English, and then translated my answer in Portugese. What a taalented young man he is!! Interview lasted for 30mins or so. It will be on the news paper tomrrow. I am looking forward seeing the article. As I do not take any photo during the interview, I will get some from Dolor later. 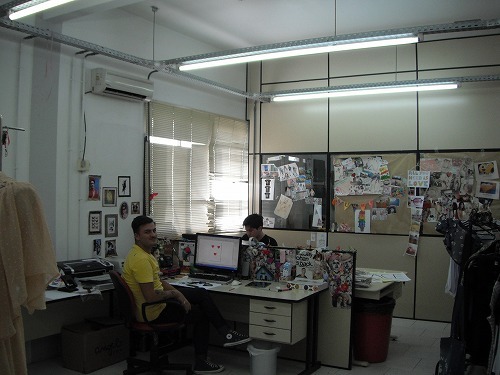 Then Pedro took me around the offices and the factory of "Angel". Started from dispatchment room, project room, design room, the factory, pressing room etc, there are 170 employees working for "Angel". 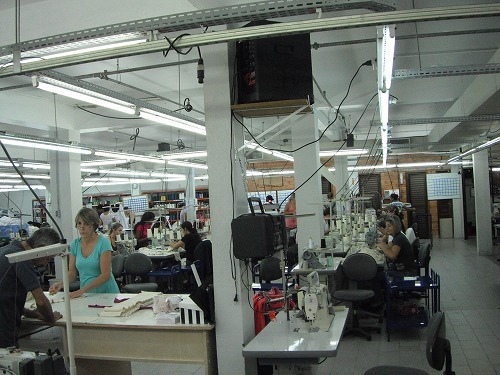 There would be around 2,000 clothes made each day. Not bad, not bad at all. Everyone seems to be happy working there. 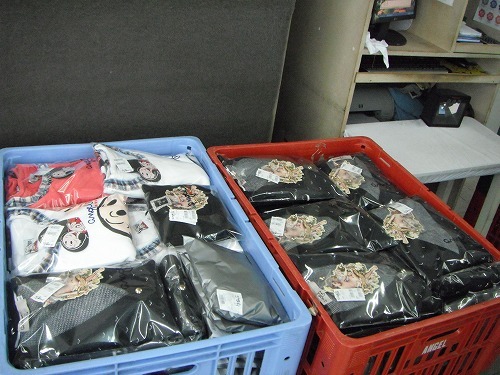 The end products await for dispatchment thoughout Brazil. There is an old Elgin sewing machine in the office of Dolor. Everything started with this old machine. The machine seems to be pround of itself! 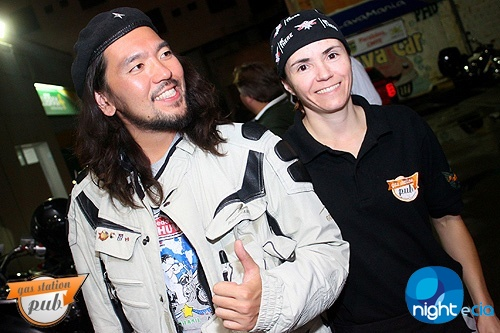 Dolor&Angela took me to motorcyclist gatherings in the evening. 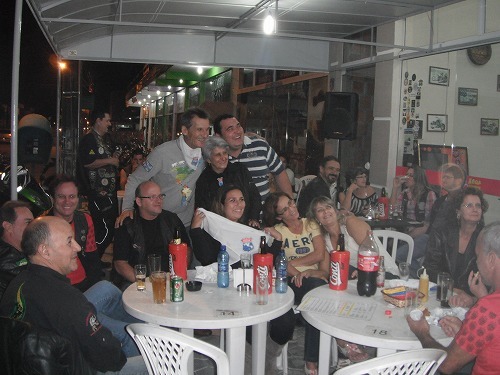 Every friday, there were 2 venues those local motorcyclists gather. 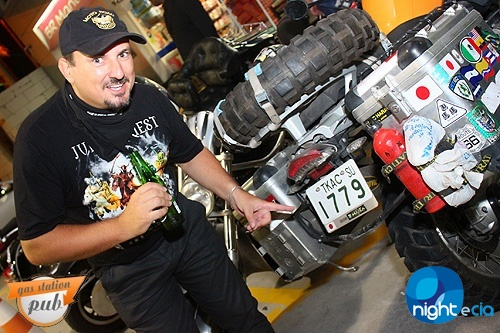 We went one "Mega lances" in Itajai first. 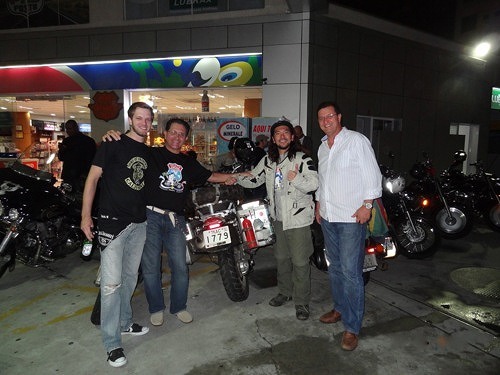 Dolor&Angela rode their beloved HONDA Valkylie 1500 and I rode my Esperanza!! I still have some pain on my right elbow, hut we reckoned it would be OK to ride for a short distance only. 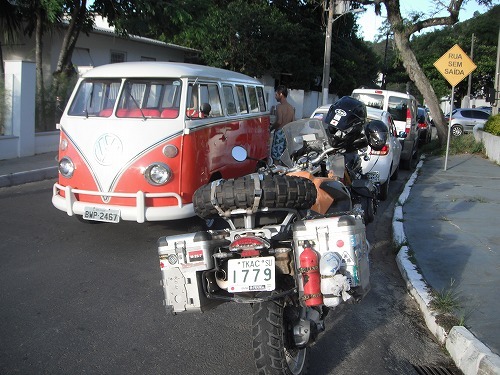 We rode on a highway and I accelarate unto 120km/h, there was no problem with Esperanza nor myself. I think I could restart my journey sometimes next week. The owner of "MEGA lanches" (the far left on the photo) is called Sidnei (Sydney), the same name as Sydney, Australia where I lived for 16 years. He said to me "It's our previlage to have a traveller like yours. So you ae my guest tonight!" Thank you so much, Sidnei!! 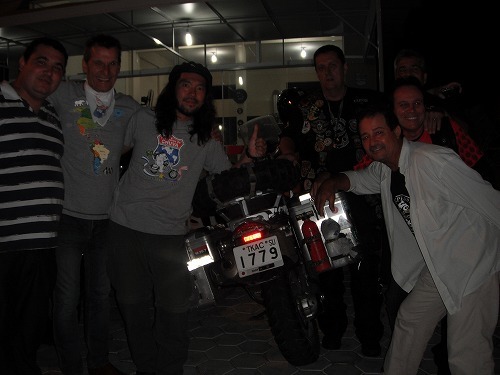 With the local motorcyclists I spoke in Spanish and a little bit of Portugese and of course Dolor translated to me some. 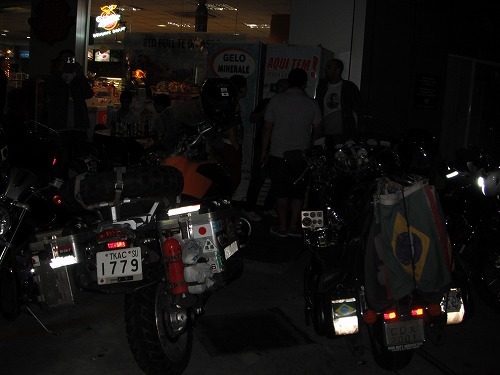 We left there around 11pm and then went to another venue "PHD" in Camboriu. 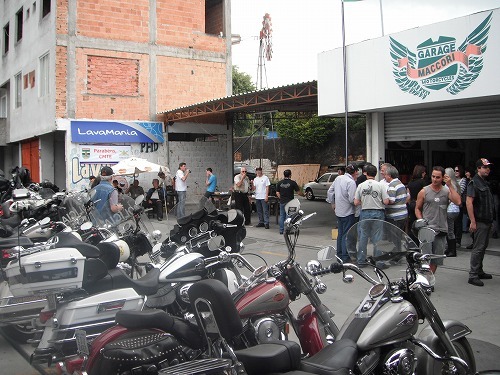 Here the mojority of the customers are HD riders, but any motorcyclists are welcome. Many people could recognise me from the TV show and the News Paper, so I was kinda famous. A little bit like a celebrity!? Alfredo and Giana were there too. I wanted to take more photos but I could take only 1 as my battery gone flat. We stayed there until 1:30am or so. We went home as we were getting tired and sleepy. But the night was still young for everyone else! 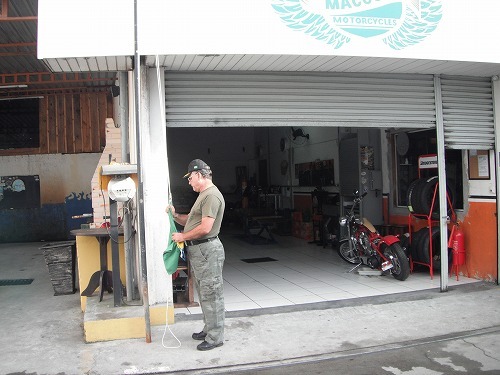 Tomorrow I am invited to a aprty hostedby the motorcycle repair shop next to PHD. But it will start fom 8am, I wonder how those peeple could get up so early. Well, could I get up that early?? I's a fine day again. I went for a walk after breakfast. My right arm seemed to be better and better each day. As I walked, I was thinking how I could write an article on fiscal adjustment of Japaese goverment. 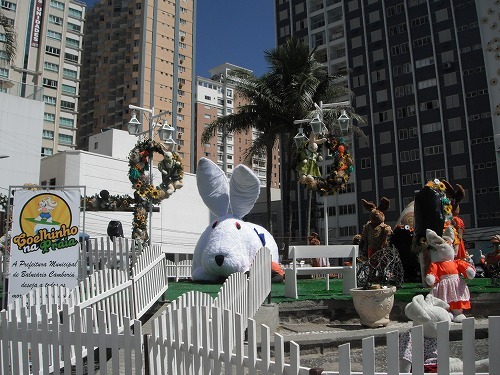 There was a big bunny at the plaza. Easter holiday is around the corner. I walked for 2 hours nd came home. I had 4 cheese breads and saome sausages for lunch. I saved a cream donut for afternoon tea. 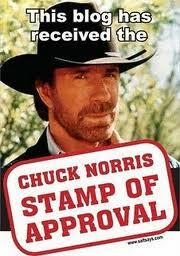 I started to write an article "Stop GST rate increase! How to turn around Japanese goverment budget deficit" in he afternoon. I wanted to write in macro view rather than microscopic vision, but as I wrote it got microscopic.... and it took tome to write. So I went for a walk to have fresh air. As I walked to the north side in the morning, I walked to the south side. 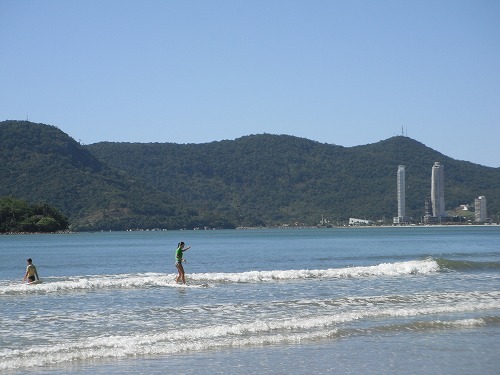 I thought I could hike up the mountain at the end of the beach. But, I found there was a river in front of the mountain! There was no bridge, so I could not cross to another shore. 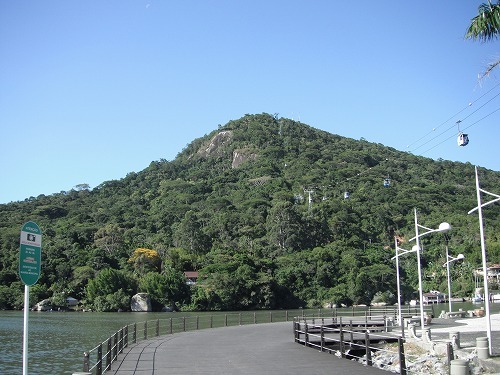 There was a cable car going up the mountain from this side of shore though. Back home, I restarted to write the article. I could keep it simpler this time. Dolor&Angela came back around 7:30pm. During dinner, we talked about life in general after retirement in Japan and Brazil and the pension system of both countries. 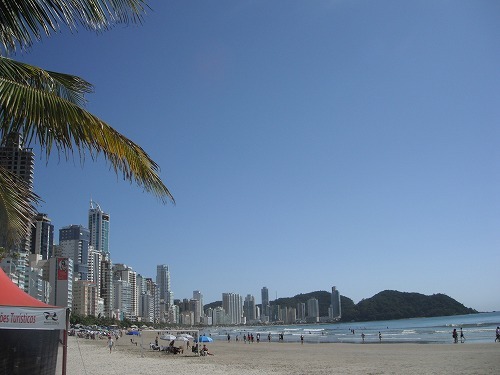 In Brazil, people could choose monthly contribution to the pension fund, and then according to the contribution, the monthly payments after the retirement will vary. 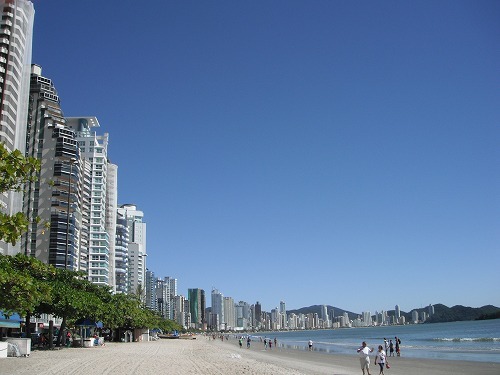 The maximum about can be received is R$4,000 (US$2,000) a month. But even thought a person makes the maximum contribution before his/her retirement, s/he will not be able to receive the maximum amount until s/he reaches to 73 years old - which is the age of the average Brazilian life expectancy. 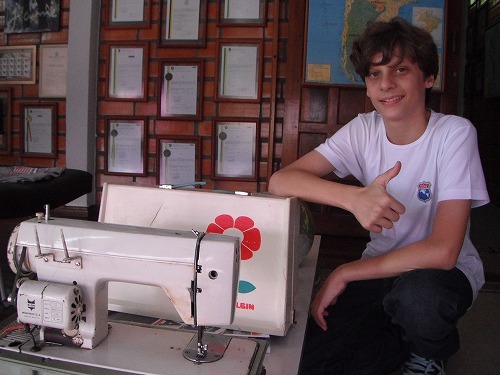 If a person retired at his/her 60, s/he will receive R$2,000 (US$1,100) a month. WIth some savings, s/he can have an OK retirement if not luxuary. 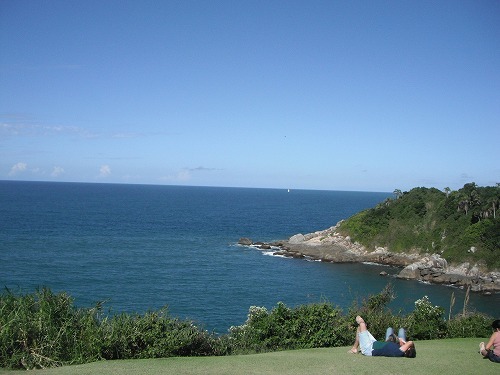 The good thing is that the Brazilian pension fund is not in bad shape unlike Japanese one. As I was writing about the Fiscal adjustment of Japanese government, so this topic was very timely and very intereting to me. And then, Dolor said "I will pick you up before noon tomorrow as there is another interview with anotehr news paper."! I did not expect this one! What a surprise!! I wonder what kind of interview it will be. 新聞に載りました! / I am on the news paper!! It was a fine day. 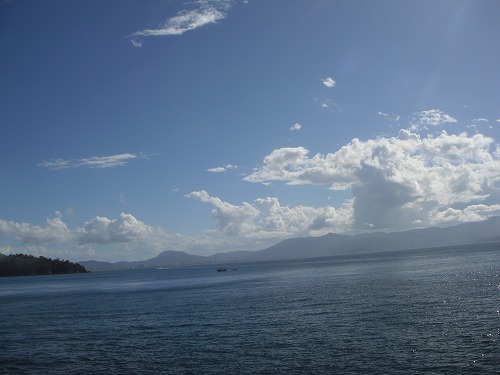 It would be good to take a walk on the beach, so I did after breakfast. I aimed to walk all the way to the north end of the beach. This is a part of ,y reibilitation. I will regain my strength by doing more and more exercises each day. I try to move my right arm gradually, not to stress it too much. 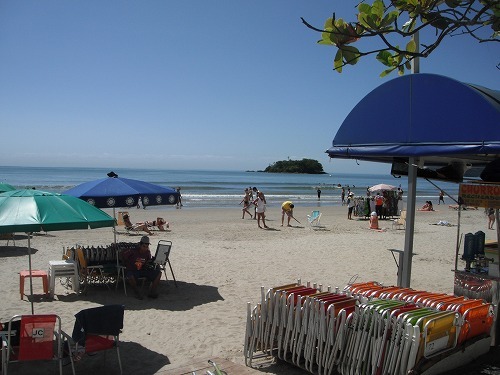 As it was a good day, there were lots of people on the beach drom the morning. I saw some hot chicks on the beach! But I could not take any photo of them. Damn. I was thinking about how toturn around the huge deficit in natioanl budget of Japan, and the relationship between competition and harmony. I will write about those on this blog at later day. There were some kids learning surfing. 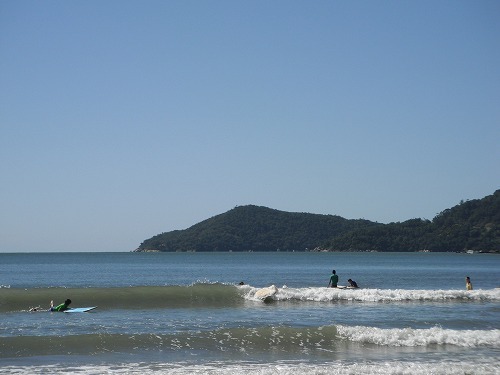 There were a few good waves but they were missing those probably as they did not paddling hard enough. It took 1 hour to get to the northern end of the beach from home. 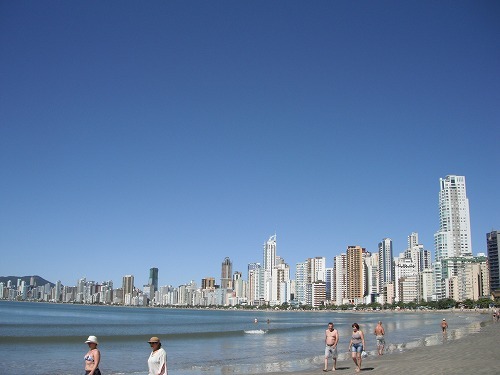 The beach of Balneario Camboriu is really long. 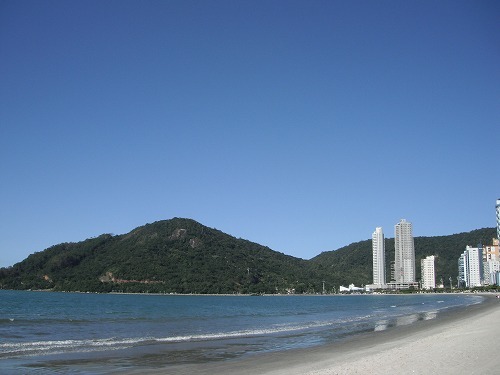 The view of the city and beach from the northern end. I walked on Ave. Brasiｌ on the way back. I bought 4 cheese breads and 2 cream donuts for lunch. I had them at home. It was an induldging moment. I updated the summary of each country. You could see them from the top menu "Data". But they are still in Japanese only. Around 6pm, I went for a walk again. This time 1 hour only. I will increase the workload and will be fitter soon! Around 7:30pm Dolor&Angela and their grandson Pedro came home. They brought me a few copies of the local news paper "Journal Boca". Because an article of my journey is on!! 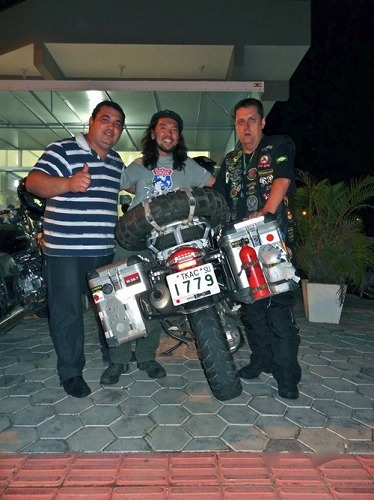 The title of the article is "Diarios de Motocicleta (Motorcycle Diaries)"! I was on a TV show the other day and now I am on the news paper. Those all thank to Dolor&Angela. The article is in Portugese but Pedro translated it to me. The content was why I am travelling, events doring the journy, encountering people on the journey and about Ernest "Che" Guevara. I hope I can get more exposure to the wider public and it could contribute to the revolution. During dinner, with Dolor and Pedro, I talked about Capitalism and Socialism. Pedro is just 13 years old but he could talk about this topic. He is a very blight young man. My right arm seems to be in much better shape now. I wonder when I could restart my trip. I hope soon!